The Crypt of the Necrodancer launch trailer came out last week, and so today Brace Yourself Games did something a little different to mark the actual launch: It released a brief behind-the-scenes documentary about the making of the game, with interviews, gameplay, and footage recorded at festivals. "We have had such an amazing time working on Crypt of the NecroDancer that we thought we’d let you take a peek behind the scenes to see how it all went down!" the studio wrote in the release announcement. "We took the game to festivals all around the world, meeting fans, making lifelong friends, and learning how to make the game the best it could be." The studio also revealed that Crypt of the Necrodancer will include two bonus soundtracks that can be unlocked by finishing the game. The original soundtrack is by Danny Baranowsky, whose previous work includes Super Meat Boy!, The Binding of Isaac, Gravity Hook, and Canabalt. But finishing the game once will unlock a "Melody Mix" soundtrack by A_Rival, and doing it again will earn a metal version by FamilyJules7x. 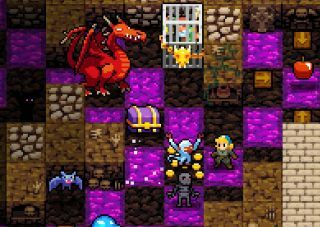 Crypt of the Necrodancer is currently available for 25 percent off its regular price of $15/£11/€15, and will remain so until April 30. Now dance!